Target has partnered with yet another designer. This time it's Carlos Falchi. 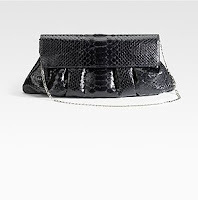 True to his normal line, his Target line will consist of faux snakeskin bags and will be available come the fall. According to WWD, "As Target’s eighth limited edition affordable handbag launch, Falchi’s designs will be available at the retailer’s stores and on target.com from Oct. 11 to Dec. 27. The 13-item line will consist of faux snakeskin handbags in jewel tones such as plum and teal with contrasting shades of brown, black and gray." I'm excited to see what the line will look like. I like snakeskin in moderation. So, a small clutch would be ideal for me. My only reservation is that like with other target lines, the faux leather sometimes looks a little...lacking? Meanwhile, I'll keep my hopes up. Are you excited for the Carlos Falchi for Target line? College Student. 19. Born and raised in New York City. Moda is fashion and aholica is addicted. I'm a big fan of Fashion Blogs, so I wanted to create my own with a mix of my interests. I'm a junior in college, majoring in Marketing, hoping to one day combine my love of both. I just want to help other students (or any readers) find internship opportunities, great sales and deals, product reviews, and discuss fashion trends. Feel free to e-mail me any questions or comments! Internships and College: School's Out!